Gov. Jay Inslee looked up at about 300 Bellevue College students Thursday. He was inspired by the turnout that filled the college’s Carlson Theater. The students, along with environmental activists were there to hear Inslee talk about climate change. 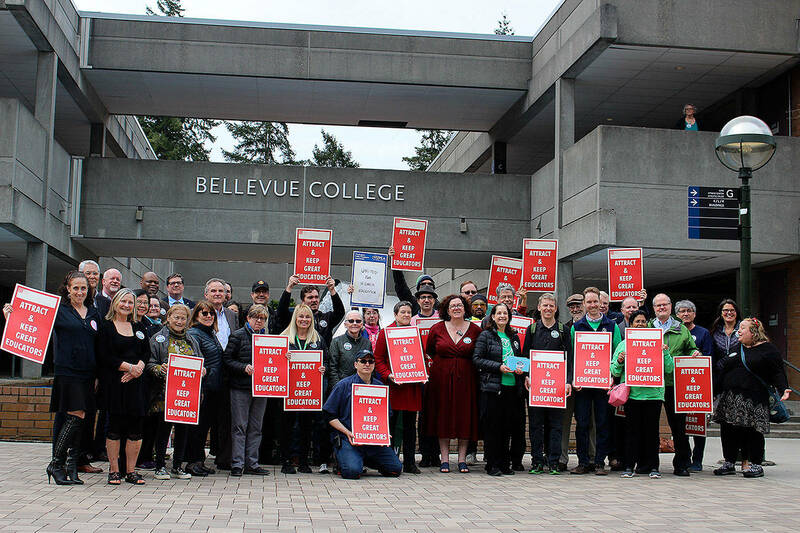 Bellevue College was one of several town halls Inslee scheduled to emphasize the importance of climate action and policies to promote clean energy and technology, greenhouse gas reductions and energy efficiency. Inslee and other governors have taken a larger role on climate change as the Trump Administration’s actions have harmed or hampered progress, including the intention to withdraw from the Paris Agreement and directing the Environmental Protection Agency to repeal the Clean Power Plan. Inslee has been vocal about the urgency and importance of state, local, and citizen action. “It’s dangerous and destructive and unless we do something about it, it will get much worse,” Inslee said at the event. Washington state has gained national and international recognition for efforts to promote clean technology, modernize the grid, electrify the transportation system, cap carbon pollution from major emitters, and more. Inslee joined Govs. Jerry Brown and Andrew Cuomo in launching the U.S. Climate Alliance, a bipartisan coalition of 14 states and Puerto Rico committed to meeting their share of the U.S. commitment to global greenhouse gas reductions. The governor will attend the United Nation Framework Convention on Climate Change COP 23 summit in Bonn, Germany next month where he and other Climate Alliance states will have an unprecedented opportunity as subnational leaders to highlight how U.S. states are stepping up to fight climate change. Bellevue College has a robust environmental science and sustainability program, and is serious about the role the college can play in championing the cause, President Jerry Weber said.